On this page of the site we will be looking at the final stretches of our loft conversion and concentrating on the second fix stage of the work. At this point of course the project is entering its final stage and the day the new room will be completed is just around the corner. This of course is an exciting time when you are converting the loft but there is still plenty of work to be done either by the builders or by the householder who is undertaking a full or part DIY project. At this point many of you may be looking at the screen thinking I'm mad. If you are at the second fix stage of your project there will be wires all over the place, bare walls, bits of insulation hanging from the rafters, tools all over the place and a thousand and one things that need doing. How can he say it's nearly finished?!? I know it may be a little hard to believe but honestly - you are nearly there and it's amazing how quickly these final jobs will get done and you will be the proud owner of a brand new loft conversion. Honest. You need to get plastered! I'm not talking alcohol here, though even in the smoothest of conversions you will need the odd tipple to steady the nerves, but rather plasterboard. Sheets of plasterboard need to be fitted to the timber battens to create the walls and ceilings. This is known as dry-lining and when these boards are fitted and skimmed the room really does look almost finished. More information about dry lining. After the walls and ceiling have been boarded out it is time to look at the second fixes for both the electrics and the plumbing. 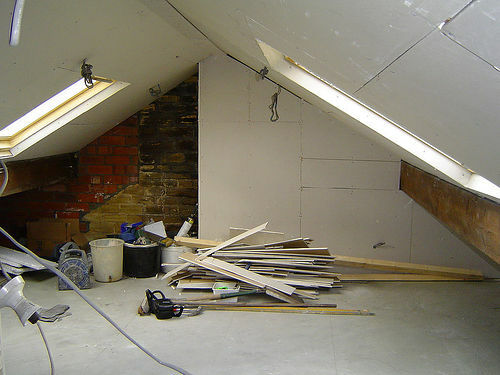 Elsewhere on our loft conversion info pages we have covered the first fix electrics and plumbing but now is the point where the work carried out at that point needs to be finished. 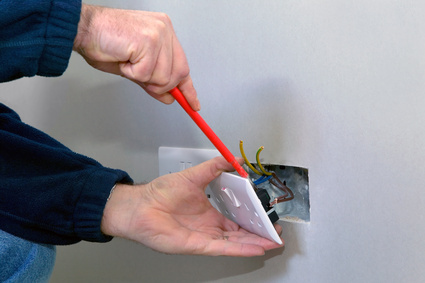 There will be wires dangling out of walls which need to be tidied up and fitted into sockets. The lighting needs to be concealed and, very importantly, the smoke alarms must be fitted and wired . This part of the electrical work must be carried out in accordance with the building regulations but is quite a straight forward process. The final stage of installing the plumbing and heating is a much bigger job than the electrics especially where an en-suite bathroom is concerned. The majority of the boiler and central heating work will have been done at the first fix stage but they now need to be finished off and tested. Whatever you do don't let your plumber off the site until the plumbing has been properly tested for leaks. Leaks can easily occur with new pipework and getting your plumber back once he thinks he has left for the last time can be very difficult. Lock the doors if necessary but make sure the job is finished before he leaves! By the way, obviously the bath or shower needs to be hooked up at this stage but it is amazing how often the work is delayed because the new suite hasn't arrived! Make sure that any fixtures and fittings are on site before they are scheduled to be installed! At this point in the project your carpenter will be the busiest person on site. There is plenty of joinery work to be done including boxing in all the pipework that the plumber has installed, laying down the floor covering and adding new internal doors as well. He will also need to install the all important fire doors, fix the skirting, finish the eaves cupboards and add balustrades to the new loft staircase. So, keep on your chippys good side! The new joists and loft floor will already be in place but now is the time to choose and put done the floor covering. The first stage is to lay the flooring, usually panels made either from chipboard or soft wood. Each has its own advantages. More Information On Loft Flooring. Something that is often overlooked when converting the loft is that quite often the building regulations will insist that all internal doors are replaced with fire prevention doors. This often comes as a surprise to householders. So new internal doors will have to be installed along with new doors for the loft conversion itself. As we mentioned above there is lots of work at this second fix stage for your carpenter including skirting, the eaves cupboards and window boards. More Loft Conversion Info On Second Fix Electrics. 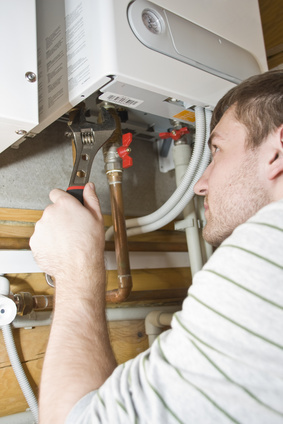 More Information About Second Fix Plumbing.